There I was late yesterday afternoon having a quick lie down, reduced to a torpid stupor by the utterly appalling and unwatchable Sunderland versus Newcastle non-event, when through eyes half-closed and gummed with sleep I happened to glance at a preview of today’s clash against Nottingham Forest. 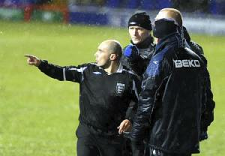 And there it was, staring me in the face, the name of one of the Assistant Referees – Mathew Buonassisi. In an instant I was restored to a state of complete wakefulness and I discovered to my amazement that I was in a cold sweat. Uwe Rosler’s side survived a late penalty scare. Defender Tony Craig was adjudged to have handled in the box and the referee pointed to the spot, only to reverse the decision after consulting his assistant. Seconds later Brentford’s Paul Hayes had the ball in the net after a Forshaw cross, but was denied by the offside flag. For what it is worth Marvin Morgan blasted a shot against Tony Craig from point blank range and the referee, far from the action, nonsensically decided to award a penalty kick but was persuaded to consult an assistant referee (not MB!) before sanity prevailed and his original decision was changed to a corner kick. What I am referring to came at the other end late on in a match which saw a stuttering Brentford team barely threaten. With time running out, Adam Forshaw jinked inside from his position on the left wing (don’t ask me why he was playing there, ask Uwe) and from the edge of the area shot towards the goal through a crowd of players, and there was substitute Paul Hayes to cleverly divert the ball from close range into the opposite corner of the net for what we thought was a late and totally undeserved winner. We rose in celebration but our delight was quickly stifled by a late appearing flag from the assistant – Mathew Buonassisi, even though it was clear that Hayes had judged his run perfectly, but the decision stood and we were denied. Buonassisi had already irked us all night with a hapless performance when literally, and I do mean “literally” every time we got the ball into the Shrewsbury half after the break, according to him it was either a foul by Donaldson or offside, and this was the crowning glory. Kevan Hurst delivered a free kick from the right and Brentford stepped out en masse, leaving the Southend attackers offside, however, assistant referee Mathew Buonassisi kept his flag down and Corr headed home from 12 yards. Brentford appealed, justifiably claiming their move up had left the attackers offside, but the goal was given. We can only assume that Buonassisi was sleeping on the job as the Brentford defence, expertly marshalled by Sam Saunders, appeared to time their advance perfectly, leaving Corr stranded and apparently yards offside, but the man who mattered disagreed and the goal was given. 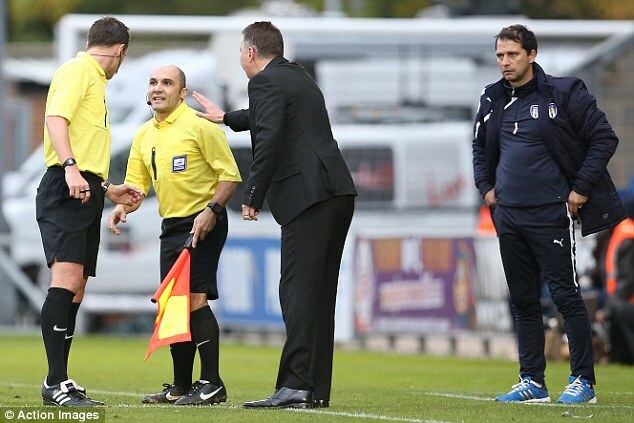 According to Uwe Rosler he apologised after the game but in the manager’s opinion this was not good enough. I share this viewpoint. What annoyed me more is that before the match, when the referee and his two assistants were warming up it was Buonassisi who engaged in some lively banter with the Brentford fans behind the goal, even kicking the ball into the goal and clapping and waving in response to some of their ribald chants. He was drawing attention to himself and I feared the worst, as here it seemed was an official who craved the spotlight, and my concerns were eventually justified when he made his fatal error in the second half. Jota had turned the Wednesday defence inside out and sold them an outrageous dummy that had the entire crowd on their feet before crossing low for Gray to surely run past the last defender to score, but Mathew Buonassisi knew better, the flag was raised triumphantly and we were denied yet again. Perhaps I am bring unreasonable, perhaps he is simply doing his job to the best of his ability and I am certainly not so paranoid as to even suggest that he has something against Brentford, but he has proved to be totally inept and it is fair to say that he has a lot of previous with us and that we have never benefitted from one of his decisions. I will do my best to ignore him this afternoon and maybe, just maybe, the game will pass without incident, but somehow I doubt it!